Sea Bass Opener Just A "Summer Bite"
Have an idea for interlocking concrete 'reef pavers' if any readers are in that business. Have Sea Bass Trips Scheduled Through The End Of June – Reservations Being Accepted. Am now opening July & August to "Whatever's Biting On The Reef Trips" - Think Flounder! Sailing Daily For Sea Bass. Saturday's 6:30 to 3:30 - $125.00 – Otherwise 7 to 3 at $110.00..
Bring A Cooler With Ice For Your Fish – A 48 Quart Is Fine. 9,226 "Oyster Castle" reef blocks by the rail – 2,644 at Jimmy's Reef – 1,890 at Ake's – 432 at Lindsey Power's – 342 at Patrick's Eagle Scout Reef. Keep dropping 24 every trip. Need another truckload real soon. Sea Bass opened Monday, May 19th. That's a much better result than being closed for the year. Almost no one who's out fishing for sea bass knows how close we came to just that – a year long closure. Among management's heroes is Maryland's Mike Luisi. He & many others worked hard to prevent needless hardship. Almost a year long closure... We nearly suffered Accountability Measures, a total closure, for catch that never actually occurred. It's great to hear folks laughing and cutting-up along the rail again. Its fun to boat a nice mess of sea bass for dinner. If we'd fished our present-day 15 cbass limit between 1993 to 2003 I could have easily run two 1/2 day trips and limited-out most trips. But we're catching dinner. Four-plus pounders here & there. A few limits during the week.. It's mostly OK, a summer bite. Saturday was a clunker. Monday too for some. Anyone with high hopes of reliving peak years of spring sea bass fishing is in for a letdown. I think the bar's going to have to be set low until flounder show. Already seeing a few; fluke may not be far off. I took world-class u/w videographer, Nick Caloyianis, http://www.nickcaloyianis.com with me on Sunday before sea bass opened. First we loaded over 3 tons of concrete as part of Patrick Miller's Eagle Scout reef building project. After deploying the material we put divers down on an wooden boat sunk as reef in 1979. The coral growth was fantastic. Only it wasn't just a boat. The very same late-1970s tires that caused reef building to come-unglued for a decade as they washed ashore after each storm. The very tires in the news several times a year back-when as today's top managers were finishing college or beginning their careers. Tires, deeply despised by today's managers, are what they think of when "Artificial Reef" is mentioned.. These remaining few tires, the ones that didn't wash ashore, have fantastic coral growth. We didn't have a problem with tires as an artificial reef substrate in the late 1970s, we had a reef-unit engineering problem. Tire units then were not constructed to withstand corrosion or storm forces. Tires placed in the mid-1990s on Maryland's Queen Reef, some 12 NM SSE OC MD, were from a New Jersey prison program. With rebar bent into each Uniroyal & concrete shot across to make a solid multi-tire/concrete composite unit, the engineering problem was solved. None of those tire units have moved – at all. They are very likely the most heavily fished artificial reef placements we have. The NJ program was abandoned, I hear, because the boys were sneaking steel back into their cells.. Tires banned everywhere now; I have no interest in battling straight uphill to re-kindle a cheap tire disposal/mosquito reduction method of reef building. We're all about concrete, rock & heavy steel for our OCRF program. It's just that everywhere you turn in the literature tires are said to have failed in every regard. 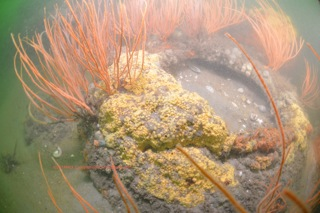 For the record: Off the coast of Maryland we have tires with gorgeous coral growth that fish have used for decades. This pic by Nick Caloyianis Productions from our recent trip..
Used to be NMFS would tell me, "They're not Reef Building Corals" as if fish had a care whether their habitat would ever build islands or continents. Long before plate tectonics, Lyle & Darwin, early geologists, they cared whether corals formed land. Today you can see fossilized corals and marine animals on West Virginia mountain tops and many other places around the world. For our earliest geologists it seemed highly plausible that land 'grew' by way of "Reef Building Corals." Darwin's book, "Coral Reefs" has no mention of fish that I can find – he was worried about where trees would eventually grow, not fish..
Near as I can tell, NMFS still isn't worried about Non-Reef Building Corals. "They're not reef building corals" used to begin & end the conversation about our singularly important, yet unstudied, coral growths. Now we just aren't having any conversation at all. It's time for NMFS to ponder if Mid-Atlantic corals, which always seem present where sea bass, tog & lobster are caught, are actually Essential Fish Habitat. Be a big switch from their 'catch restriction only' method now in use. Right now we have no production model. Although commercial fishers sell by the pound & professional recreational skippers must submit daily catch-logs creating a scientifically firm idea of actual catch: MuRFSS & now MRIP's recreational catch estimates are calling the regulatory shots. Those statistically created catch-estimate numbers rise and fall so swiftly they could make a longline skipper seasick. While commercial & for-hire data trends are generally more smooth; MRIP's estimates, especially of private boat landings, bounce about like no fishery ever witnessed at sea. Management does not consider hardbottom reef. Management has no consideration of habitat fidelity in winter regulation. I think the real key; what we should address right away – THIS WEEK -- is age at maturity: How to force sea bass to spawn young.. Instead, MRIP will again publish closely watched estimates and managers will again respond as those number dictate. If there's a statistical spike, an outlier, in any one state; the whole region will again be taken to debtor's prison as regulations tighten. Or a fishery closure may finally overwhelm our valiant rearguard; the managers fighting against nonsensical catch estimates' regulatory result. If managers were allowed to call hokum on statistical landings vs reported landings they could use a new science to manage our reef fish. Its called Biology. Some super-simple biology is the difference between male & female sea bass. Not-so-simple at the start because they all begin life female; once switched to balance a given reef's spawning population, however, males develop a blue hump on their forehead in spawning season. You can spot them from 100 feet away ..in air at least. If the sea bass population's age structure were thought of as a pyramid with oldest fish at the top: in early management the entire pyramid, the whole DelMarVa marine population of sea bass was in the spawning stock. The pyramid grew larger each year. Now just the pyramid's tip represents spawners – and those are the ones we're allowed to box-up for dinner. The pyramid is shrinking. Has been for years. Getting real noticeable now though. Need a hard look at sea bass from a reproductive biologist's perspective. The smallest male sea bass seen on my boat so far this season has been 10.75 inches. That one male was really small compared to others. Up until 2001 or so we'd see hundreds of sub-legal males a day – sometimes a thousand. Males we had to throw back, many of which were under 9 inches, always comprised a large part of our day's catch. Up until 2001 the sea bass population along DelMarVa grew substantially each year. With smaller size limits, no bag limit, and no closed season, the population doubled several times after regulation began in 1997. The reason we don't see abundant small males today is because they're not joining the spawning population for several more years – today's size limit delays maturity. We likely boxed in a single hour back in the early years of management--when the population grew incredibly, what we've taken all this week. I believe that's an accurate representation. There's that much difference. We'll witness the DelMarVa sea bass population continue to shrink despite a fantastic reduction in catch until management acts to correct management and abandons their Quixotic endeavor to lance each apparition of overfishing seen only in small segments of MRIP. From the depths of real overfishing in the 1970s, 80s & 90s, to a wonderful restoration in the late 1990s/early 2000s – to our fishery being hijacked by bad catch estimates: We now have to re-restore sea bass. I think the last thing in the world that will re-restore sea bass production is further catch restriction. Our catch will be so low along DelMarVa this season that managers could easily drop to 11 inches with no factual quota issues. That would drive sea bass "age at maturity" back to age 1 & 2 by mid-summer. Spawning renewed, we'd have our old fishery back in just a couple years. Instead, this wreck will run its course. The management community, like deer in a jacklight -unafraid & unknowing- have their understanding of sea bass production modeled from statistics that defy fisher's belief. Catch that could not possibly be true is the only truth they know; they call it science. I believe MRIP is a failure. A complete & utter failure. As I have illustrated many times with their own estimates, MRIP offers far-worse guesses of catch than MuRFSS did. Back in the mid-2000s Congress told NOAA to get rid MuRFSS and fix their estimates. But no one's rescinded "Accountability Measures" based on MRIP's inability to provide improvements in accuracy. We have to do that. We have to MAKE SURE Congress hears us & knows they're being fed baloney when they're told how accurate the new MRIP estimates are. So far as I'm concerned, that implies "we accept wildly incorrect as normal." They force the management community to also. When experienced skippers are catching clients limits, everyone else should be doing pretty good. That's what's real. When professional recreational skippers aren't catching much & neither are commercial fishers, that's when private boats shine in MRIP's world. In reality, when one state/one two-month period & one mode (private boat) is estimated to have higher landings than all professional & all commercial effort for an entire year, in an entire region — That's Not Going To Blend In – It's Such An Enormous Spike That It Throws The Whole System Out ..and these spikes are common. Our livelihoods are being squandered by statistical malfeasance while management's potential drifts away like plastic garbage in a tide line. I promise its not overfishing that's causing our sea bass decline. That stopped 17 years ago. Management is destroying the DelMarVa sea bass fishery. Maybe unstoppably. Compounded by Sandy's effects, it may be too late. We have an incredible effort ahead to reach a sea bass population as represented by commercial landings in the 1950s. I'm very sad to report that our present restoration course is taking our sea bass fishery hard astern. This simple fact, the older sea bass are when instinct forces them to join the spawning population, the fewer sea bass will actually be in the spawning stock, is the primary cause of our present decline. We must reduce the size limit to re-engage younger fish in the spawning class. Lowering a size limit without Lord MRIP's approval is a cyanide pill no manager wants to bite. Instead, the poison drifts from large meeting rooms down to our reefs, down through our fishery & poisons our economic model. Pain's not hard to take while watching dozens of fisheries. It's excruciating when it's your primary fishery.. Virtually every sea bass in the ocean aged 8 months & up (& not juviniles in an estuary) was in the spawning population up until the year 2000. Now, because of size limits shooting past 11 inches in the guise of "restriction necessary to prevent recreational overfishing," sea bass are not even starting to spawn until age 3 or more. That's exactly when they become legal to recreational fishers and a year after they became legal to commercial effort. With spawning production thusly curtailed -though inadvertently- by regulation, the spawning population has shrunken to ineffectiveness. Write your Representatives and tell them MRIP's no damn good. Tell them we expect fishery managers to understand & employ habitat production as well as age forcing. Tell them we want science, not statistical chicanery, used to manage fish.